The Charleston streets are dressed for the holidays in sophisticated Southern style: topiaries adorned with red ribbons, garland entwined with white lights, and poinsettias potted in gold planters. The high class bordello in a stately historic home is certainly no exception. 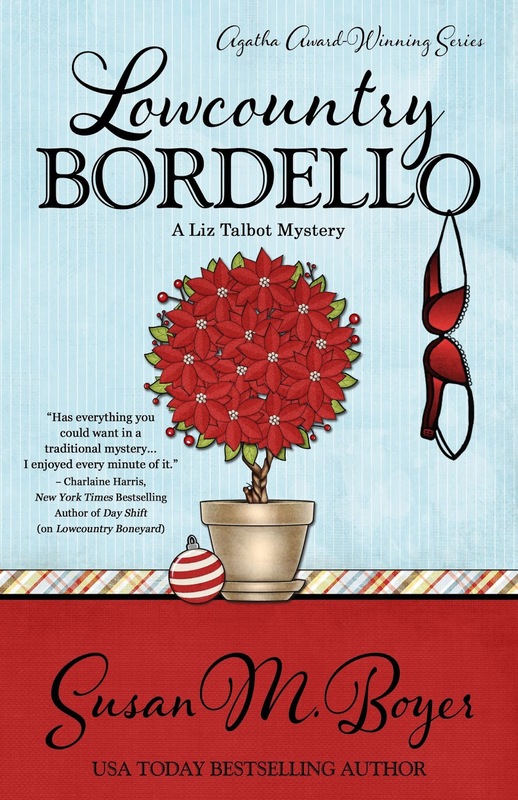 When Private Investigator Liz Talbot’s dear friend Olivia swears she saw a dead body in the parlor of this bordello, one Olivia accidentally co-owns, Liz promptly comes to her aid. With her wedding back home on Stella Maris less than a week away, Liz must juggle one elderly madam, two ex and future in-laws, three ghosts in the bordello, four giddy bridesmaids, five lovely courtesans, six suspicious patrons…and a partridge in a pear tree as she tries to keep her bridesmaid out of jail and live to walk down the aisle. Related subjects include: women sleuths, private investigator mystery series, murder mysteries, whodunit mysteries (whodunnit), book club recommendations, Southern fiction, Southern humor, Southern living. The dead are not altogether reliable. Colleen, my best friend, calls herself a Guardian Spirit. I can’t argue with the facts at hand: She’s been dead seventeen years, and she watches my back. I’m a private investigator, so situations arise from time to time wherein my back needs watching. Technically, Colleen’s afterlife mission is to protect Stella Maris, our island home near Charleston, South Carolina, from developers and all such as that. Since I’m on the town council and can’t abide the notion of condos and time-shares on our pristine beaches, protecting me falls under her purview. Solving my cases, however, does not. She’ll tell me that in a skinny minute should I happen to mention how she could be more helpful. But she has been known to toss me the occasional insight from beyond that provokes a train of thought, which, upon reflection, proves useful. Here’s the thing: Colleen shows up when she detects I’m in danger. Sometimes she warns me in advance. Occasionally she drops by just to chat. But she doesn’t come whenever I think of her or call her name. It rarely works like that. One Monday in December, I really could’ve used Colleen’s perspective. We were closing in on Christmas, and I was getting married on the twentieth—in five days. I was a teensy bit distracted, is what I’m saying. It was a little after ten in the morning, and I was at my desk in the living room of my beachfront house, which doubles as my office. I was deep into research on a criminal case Nate, my partner and fiancé, and I were working for Andy Savage. Andy was a high profile Charleston attorney, and while this case didn’t amount to much more than fact-checking, we hoped it would lead to a lucrative relationship for Talbot and Andrews, our agency. I stared at my computer screen and reached for one of Mamma’s Christmas cookies. My phone trilled out the ringtone named Old Phone. Old Phone was reserved for old friends. I grabbed my phone instead of the cookie. Robert Pearson. He’d been a year ahead of me in high school, the same age as my brother, Blake. He’d married one of my best friends. Robert was also our family attorney, and he and I were both on the Stella Maris town council. I tapped the green “accept” button. “I have an appointment at one that’s going to take most of the afternoon.” Multi-toned highlights are a maintenance issue, especially with hair as long as mine. My natural sandy blonde would turn Tweety Bird yellow if Dori looked at it wrong. She always took her time, but five days before my wedding she’d be excruciatingly meticulous. I couldn’t walk down the aisle with yellow hair. “Thanks, Liz. I really appreciate it.” He sounded way too grateful for such an ordinary request. This is what should’ve tipped me off that something was up. Copyright © 2015 by Susan M. Boyer -- This excerpt is reprinted by permission from Henery Press. All rights reserved. 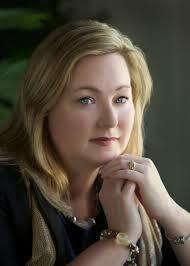 Susan M. Boyer is the author of the USA TODAY bestselling Liz Talbot mystery series. 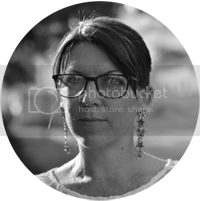 Her debut novel, Lowcountry Boil, won the 2012 Agatha Award for Best First Novel, the Daphne du Maurier Award for Excellence in Mystery/Suspense, and garnered several other award nominations, including the Macavity. Lowcountry Boneyard, the third Liz Talbot mystery, was a Spring 2015 Southern Independent Booksellers Alliance Okra Pick. 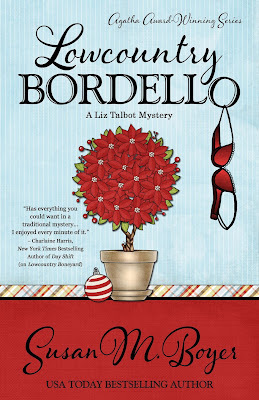 Lowcountry Bordello, the fourth book in the series, was released November 3, 2015. Susan loves beaches, Southern food, and small towns where everyone knows everyone, and everyone has crazy relatives. You’ll find all of the above in her novels. Susan lives in Greenville, SC, with her husband and an inordinate number of houseplants.